The 41st World Junior Championship held in Goa, India served as perhaps a watershed point in the career of IM Amon Simutowe. After taking the African continent by storm with his quick ascent, he has become a fixture in many competitive international tournaments including three World Junior tournaments. After battling for the title in 2000 tournament with 8½-4½, and scoring 7-6 last year, he closed the book on a storied junior career with 7½-5½ points and should vault back over the 2400 ELO mark. He turns 21 in January. Held in a scenic Goa resort, this year's tournament was won by Armenian Lev Aronian with 10-3 and followed by Luke McShane of England (9½ pts.) and GM-elect Surya Shekhar Ganguly of India (9 pts.). The Girl's tournament saw a reversal of last year's result with China's Zhao Xue edging Humpy Koneru on tiebreaks on 10½-2½. Russia's Nadezhda Kosintseva took the bronze medal with 10-3. 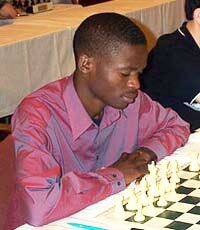 Simutowe expressed dismay at the quality of his play during the tournament. He squandered a good position against China's GM Bu Xiangxhi, fell into time pressure, and in the skirmish, lost a pawn and the game. It is rare that the Zambian IM falls into time pressure and told The Chess Drum that, "if one is in time pressure, then the opponent should also be in time pressure." Obviously, Simutowe's pending plans to start university studies in the U.S. were taking their toll on his concentration. In round eight, Simutowe had a good position against Russia's GM Ernesto Inarkiev, but ignominiously tossed piece with 19…Nxe5?? Simutowe sandwiched his losses with wins over a seemingly endless supply of Indian opponents (scoring W4-L1-D2 against Indians). The Zambian IM played a great game against Malaysia's Lim Yee Weng. 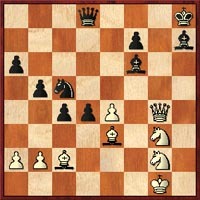 In the diagrammed position, Simutowe played 32.e5! refuting an earlier piece sack. In Simutowe-Lim Yee Weng, white plays 32.e5! winning after 32...dxe3 33.exf6 Qxf6 34.Qc8+ Bg8 35.Qh3+. Despite his inconsistent play, Simutowe appeared to enjoy good relations with the players including winner Lev Aronian with whom he spent some analyzing with before departing. He also had a chance to exchange fellowship with Pontus Carlsson, the Columbian-born Swedish player. Yet an even brighter future awaits Simutowe as this past year has been a challenging one. He certainly has blazed the trail for African players and in an interview, stated that African chess is only limited by exposure and opportunities available… talent is not an issue. Certainly he is an example of that.